Do you Instagram? Me, too! 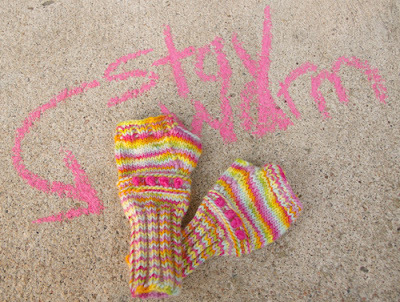 The 'Stay Warm' mittens are perfect hand warmers for kids on cool mornings! 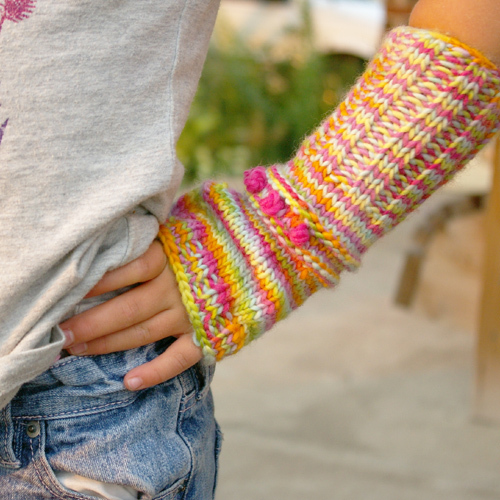 Knit these fingerless mitts in an evening, using scraps or a bit of favorite yarn. 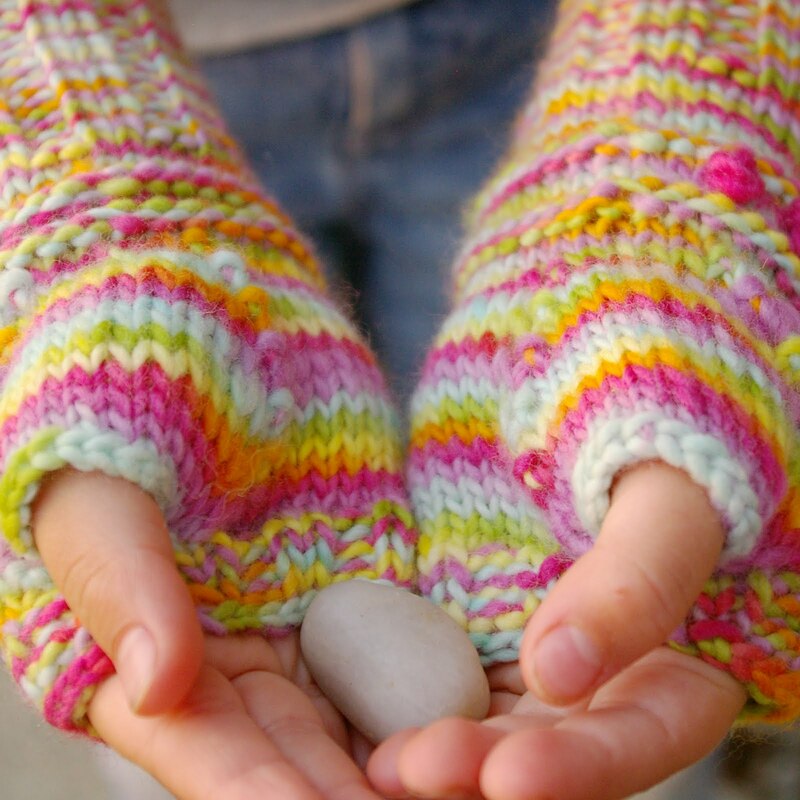 One of the prominent principles in Waldorf education is the concept of warmth, and its importance physically, emotionally and developmentally for children. Although we are happy homeschoolers these days, these mittens were inspired by my little one's chilly fingers while waiting for the bus on nippy northern Ontario mornings! Green String’s ‘McKenzie’s Rainbow’ on worsted weight Purewool single ply merino. And the very best part? 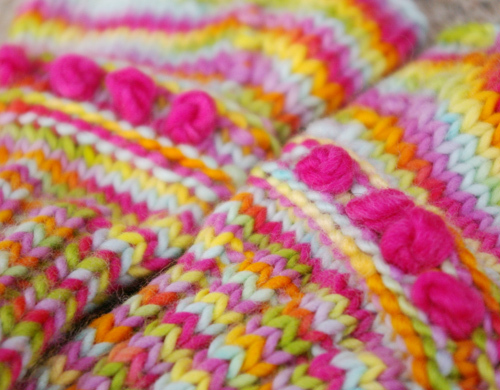 The mittens used so little that I still have lots left for many other projects! This pattern is written for children age 3-8, or thereabouts (real, technical, huh?). Pictured on an average 6 year old’s hands. For an older child,(6,7,8) I would suggest making a shorter wrist cuff for a better fit at the cuff opening. Increase by knitting into the front and back of the increase stitch. Cast on 32 stitches (loosely) and distribute evenly on your DPNs. Work in K2 P2 ribbing until your cuffs reach the desired length. The pictured mitts have 4" cuffs. Purl the next two rounds. stitches remain. Place marker. Increase one stitch in the next stitch, knit 2. Repeat rows 3 & 4 until you have 46 stitches. (this will create the thumb). daughter, I need only do 2 rows in knit before proceeding to the ribbing to finish off. Do 5 rounds in K2P2 ribbing. Rosettes: I simply used a doubled strand of contrasting yarn and a needle. Weave in the ends, and bring the needle through to the front between the two stripes of purl stitching. Make a French Knot by wrapping the yarn twice around the needle. Secure your ends (and don't leave any loops behind the rosettes for little fingers to catch on the way in!). Please feel free to adapt (or improve!) as your heart desires. ©Photos and text Copyright Lori Campbell/ Beneath the Rowan Tree, 2011. 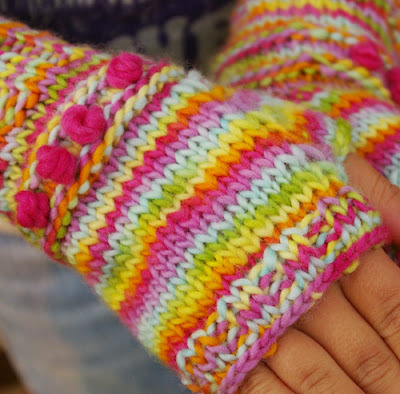 Love these - I'm going to try thicker yarn and bigger needles so they will fit me!! Ooh! Great idea! Let me know how it goes!